Theatresports' new show is a comedic adventure with a new superhero each night. It’s a bird, it’s a plane, it’s Theatresports’ Superhero Show! 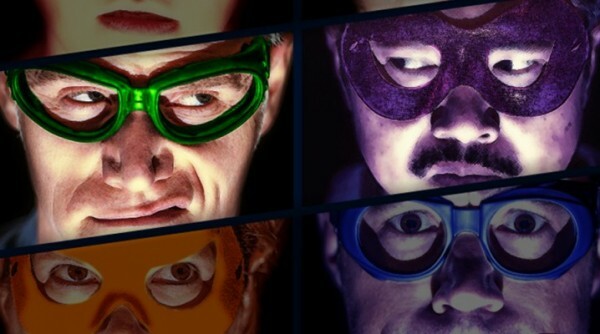 Each night, the improv masters of Theatresports entertain audiences at The Improv Centre with a different caper involving a unique superhero created from audience suggestions. For example, the night I was there the hero was the Pecker, a bird whose special ability was spaghetti fingers. The narrator has a bit of control over the action on stage as he asks for the audience to shout suggestions or signals a scene change for the performers. There is also a basic structure and setting to the show — it’s set in Big City, and the narrator asks the audience specific questions in order to create the tale. Other than that, nothing is scripted, and the performers have to make up a hilarious story on the spot, given only a couple of pieces of information. I was impressed by the performers’ ability to maintain the continuity of the story, especially when they were switching back and forth between characters and settings so often. Some played up to four characters, all of whom had different accents — I suppose the voices help the actors keep things straight for themselves. Margaret Nyfors did a great Russian accent during scenes where she was doing yoga in the park. She was also great in scenes where a plumber was fixing up her pipes and she offered him a drink from her bathroom liquor cabinet. Of course, there is always a villain in a superhero story, and this one was so evil that he had a hummingbird for a thumb. The hummingbirds were the Pecker’s mortal enemies, and the climax was a hilarious scene of birdbrained mayhem. If you have never seen a Vancouver Theatresports League show, it’s time you did. These improv artists are so talented, and no matter what kind of superhero tale they come up with, it is sure to be a memorable experience. The Superhero Show runs from October 2 to November 15 at The Improv Centre. For more information, visit vtsl.com.